Please find below the press releases in French, German, English, Spanish, Greek, Polish, Portuguese and Georgian. The purpose of this campaign is because, when compared to other rail operational statistics, too many people die or are injured in accidents at level crossings. These however are in the majority of cases due to misuse by motorists and pedestrians whilst the popular misconception is that these fatal accidents are a railway problem. Conferences on the issue show that the only really effective way to decrease the number of accidents, short of closing all level crossings, is education, highlighting the risks and making people aware of the potential consequences if they do not follow the simple rules of the road. Running under the motto “Act safely at level crossings” the railway community, in conjunction with a small but rising number of road sector organisations and in conjunction with the European Commission and the United Nations Economic Commission for Europe (UNECE), has established the ILCAD campaign to raise awareness among road users and pedestrians of the risks at level crossings and to change their behaviour. More than 40 countries around the world have been engaged again in ILCAD 2011. You can join free of charge as all activity is on a purely collaborative basis. 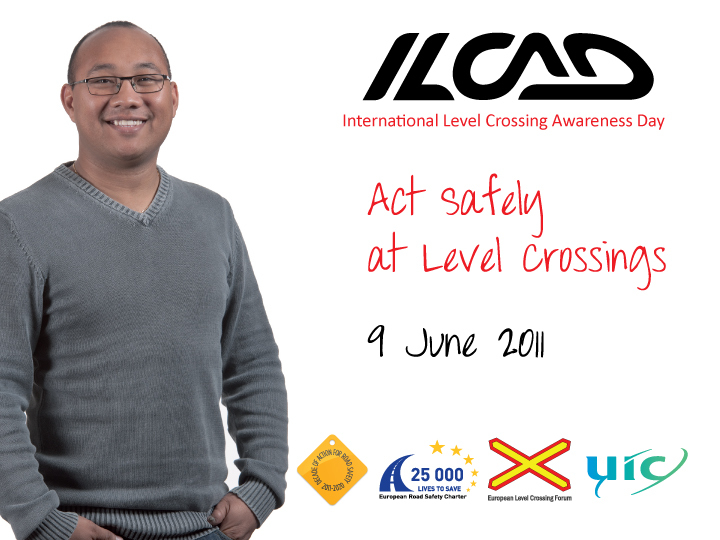 Building on the successes of the 2009 and 2010 campaigns, the ILCAD 2011 (International Level Crossing Awareness Day) focused on the principle date: 9 June 2011. In addition the United Nations "Decade of action for road safety 2011-2020" has been officially launched on 11 May. UIC as the ILCAD coordinator has been granted permission to use the logo of their campaign in our communication actions on ILCAD as an event related to road safety. So join us and help the railway community to reduce this level of operational risk that we face at the interface with the road sector.